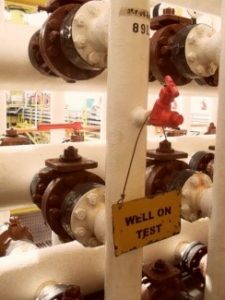 A large National Oil Company in Southeast Asia was engaged in a full retrofit and redevelopment of a 35-year old brownfield with a goal of automating offshore processes and significantly reducing production decline rates. APO was brought in to work with the teams developing the measurement and control instrumentation and the design of a tri-node collaborative work environment in the onshore operations centers, and to focus on a change management program that would enable the use of predictive analytics in new operations. After evaluating the financial impact and barriers to adoption of multiple analytics workflows, the project targeted analytics data for remote compressor monitoring, well tests, and bean adjustment. The full project was eventually expanded to include 25 asset workflows supported by an integrated live asset model. Operational workflows covered facilities monitoring, surface network and flow assurance, planning, well performance, artificial lift, and reservoir and enhanced oil recovery procedures. After identifying dispersed data sources and a lack of data management tools as early challenges, the team recommended a framework and architecture that included modernized field instrumentation and sensors, automated real time field data access, and surveillance and analytics at onshore operations center. The goal was to reduce unplanned deferment and downtime resulting from reactive workflows and institute a process of management by exception. The analytics platform was designed to aggregate sensor data from gauges, well headers, trunk lines, separators, gas lift injection lines, waterflooding equipment, tubing hangers, downhole assemblies, multi-phase flow meters, and even the microwave telecoms equipment used to transmit data from the platforms. 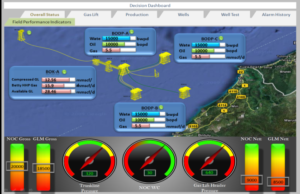 The resulting actionable information is displayed in smart views and shared between offshore technicians, production analysts and technologists, rotating equipment engineers, facilities engineers, and process engineers. Advanced analytics allows customized views for workflow owners in order to facilitate the use of the collaborative work environment. Results of the full Integrated Operations projects have been documented in over 10 individual SPE papers and include a 70% improvement in response time to the field, with fast-loop decision cycles reduced from 10 days to 5 minutes, and medium-loop asset operational reviews now performed hourly and daily rather than monthly. In addition, gas lift performance has improved by 20%, field visits and associated QSHE risk has been reduced by 70%, production has increased by three times from less than 5K to more than 15K bopd, and well uptime has improved from 60% to 80%. Since the work was performed as part of a Risk-Sharing contract, financial benefits have accrued to all participants in the program.